"Rain commenced, and wind did..."
Born in Florida, Raymond McDaniel lives in Ann Arbor, Michigan, where he teaches at the University of Michigan and hosts the reading series at Shaman Drum Bookshop. His first book, Murder (a Violet), won the National Poetry Series competition, and his latest collection, Saltwater Empire, offers provocative insights into a post-Katrina New Orleans and the surrounding South. "Assault to Abjury" paints just one of these haunting portraits; in a review of the collection, Stephen Burt writes, "From the title onward these poems often look out, into the mouth of the Gulf, along an ecosystem more water than land, whose treasures and threats are more than we can handle." When asked in an interview whether poetry can create change in the world, McDaniel responded, "Poetry is never going to directly induce that level of change (nor should it, lest it become indistingishable from those authorities it ought to upset), but it can remind people, and teach them to realize in practice, that things can be made—literally made—different, and differently." McDaniel is also well known for his lively poetry reviews on The Constant Critic Web site. 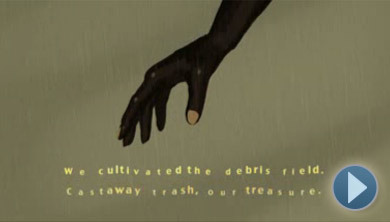 This animation was created by Allison Alexander Westbrook IV, and McDaniel reads. To read this and other poems by Raymond McDaniel, as well as biographical information about the poet, please visit the Poetry Foundation Web site.